Founder Malcom McGinnis and brewer Alisha Blue. British-style brewpub Freewheel Brewing C0. wants you to come and drink, for hours. That’s a ‘session,’ hours and hours of drinking, preferably drinking ‘session’ ales. Not to worry about inebriation. Full of flavor but lower in alcohol, these brews allow thoughts to stay clear and conversations unfuzzy. At a time when 10 percent ABV double IPAs are all the rage and practically are served with a designated driver, Freewheel is charting its own course with 5 percent content, making it a standout in the craft beer industry. The brainchild of four biotech guys, Malcom McGinnis, Pete Krausa, Larry Bucka and Gary Waymire, Freewheel opened in Marsh Manor in 2013; however, its genesis dates to the late ‘80s and McGinnis’ home brewing hobby. It wasn’t until 20 years later, when he and Krausa sold their biotech company, that he got serious about opening a brewery. With the help and enthusiasm of Larry, Garry, and British-born Pete, Freewheel took shape. When it came time to start brewing, the biotech-turned-brewing foursome noticed a trend in California craft beer: big and bold, with a real kick in the stout. Freewheel’s founders wanted to do something different. Though British session ales are often, and unfairly, branded as “warm and flat”, it was an open niche in the market. Furthermore, the session ale fit perfectly into the plan to create a sociable, community-friendly pub. How did three Yanks and a Brit establish a British-style brewpub this side of the pond? Good, old-fashioned online research. And an epic road trip. Having researched England’s award-winning breweries, McGinnis and Krausa motored through the country, visiting a curated list of pubs and picking the brains of brewmasters. In the process they established relationships with brewers who continue to serve as mentors and guides. McGinnis admits that the “warm and flat” stereotype is not to be underestimated, and something they never tire of explaining away. 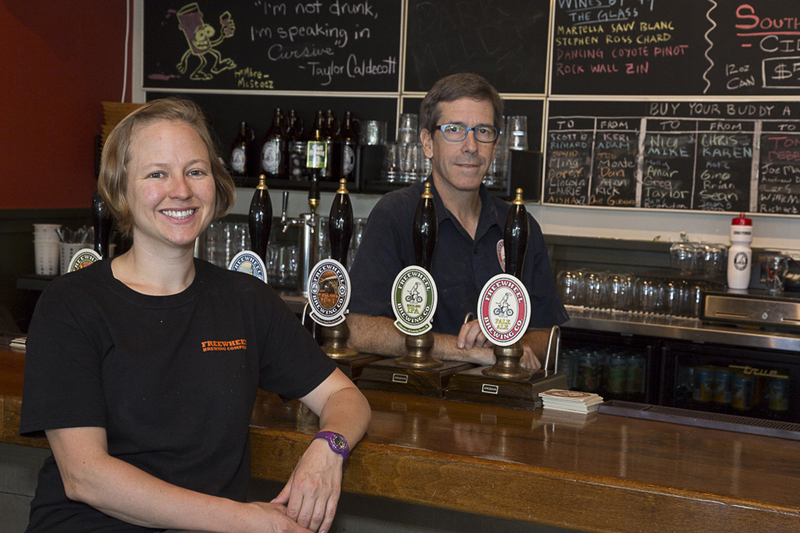 Alisha Blue, who studied and honed her brewing craft in Chicago, Germany and England, brews alongside McGinnis at Freewheel. She deftly explains what makes British beers different. “English ales tend to be more nuanced and subtle in flavor. They have a lot of it, but if you served them fizzy and really cold, all of those nuances would be ruined. So the flavors develop in tandem with the serving method,” she said. The consequence, he adds, is that without an excess of chill and carbonation there is “nowhere to hide.” Every decision the brewer makes is on display — what he or she intended, from ingredients to handling, is what you get. With ten brews available it can be hard to know where to start. The best way to experience Freewheel is with the tasting flight. A hearty sample of six of Freewheel’s brews, this is the surest way to learn about session ales and find a favorite, or two. Ask questions. Brewers and bartenders are on hand, well-informed, and eager to answer. “A lot of what we do is educate folks on why our beers are different. People come in expecting something totally different, and it’s an opportunity for us to tell them about our beers,” Blue said. The beauty of “session” style drinking is that there is room to enjoy a number of pints. Perhaps start with the Freewheel Special Bitter, with its hint of caramel hops, then move to the Big V Amber, a full-bodied beer named for the burly British welder who built Freewheel’s brewery. The choice is yours, but if you need a guide the staff at Freewheel is more than willing. Freewheel has become a hub where families can gather and strangers can become friends. “One of our regulars told me that she has met more of her neighbors here than she has living on the same street for the past 18 years. I love that,” said McGinnis. Though you may be in for a session, be ready to get pulled onto a trivia team, or hop up to the karaoke mike and belt out a few tunes. Taste, explore, enjoy the nuanced flavors that session ales bring to the palate. Do as you wish, but never call the ale warm.